Kanye West is to have a cameo role in Anchorman: The Legend Continues. The 35-year-old rapper was spotted filming scenes for the comedy sequel - which stars Will Ferrell as bungling news reader Ron Burgundy - on the set in Atlanta, Georgia, on Tuesday. Kanye was dressed in an afro wig and was seen fighting with several famous faces, including Tina Fey, Amy Poehler and Sacha Baron Cohen. Anchorman 2 will feature a host of big name stars in roles, such as Liam Neeson, Will Smith, John C. Reilly, Nicole Kidman, Jim Carrey and Jane Lynch. Meryl Streep is also hoping to make an appearance in the highly anticipated movie and has even approached returning cast member Steve Carell about getting her a part. “Meryl told me she was a huge Anchorman fan and she'd love to have a cameo in the sequel. That could be really funny. There are going to be plenty of great cameos in this movie,” Steve previously said. Sacha Baron Cohen Banned From Oscars? Sacha Baron Cohen might be banned from walking the red carpet at the Academy Awards on Sunday. The British comedian is believed to have planned to attend the glittering ceremony as General Aladeen - his character from forthcoming movie The Dictator - but studio bosses frown on stunts in front of the world's media and are considering reversing his invite, which he gained for his part in Martin Scorsese's Hugo. The Academy is believed to have got in touch with Sacha's representatives to confirm whether or not he is planning to do the stunt, according to The Wrap. 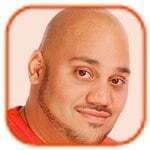 Sacha has a history of using his characters to create controversy - his alter-ego Bruno from the movie of the same name became well known for antics including storming the stage during a fashion show and landing on Eminem in a white jock strap during the 2009 MTV Movie Awards. In 2000 his first major character Ali G offered British MP Neil Hamilton a cigarette allegedly containing cannabis, which he accepted and smoked. The Dictator - which also stars Megan Fox and Anna Faris - is due for release in May. 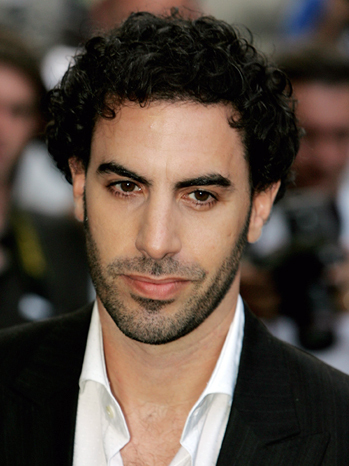 Sacha Baron Cohen is set to star in Les Miserables. The Hugo actor - who is best known for comedy roles in films including Borat: Cultural Learnings of America for Make Benefit Glorious Nation of Kazakhstan and Bruno - will play Monsieur Thenardier in the forthcoming musical, which will be directed by Oscar-winning filmmaker Tom Hooper. Sacha rounds of a huge cast for the film, which includes Hugh Jackman, Anne Hathaway, Helena Bonham Carter and Russell Crowe. Glee actress Lea Michele is also in the frame for a part, playing Eponine, although Taylor Swift and Scarlett Johansson are also said to be vying for the character. Tom - who won an Academy Award last year for his work on The King's Speech - recently confessed the movie would be shot in 2-D instead of 3-D, although he had flirted with the idea. Both Megan Fox and John C. Reilly are set to appear in The Dictator. The pair have signed up to make cameo appearances in Sacha Baron Cohen's forthcoming comedy, though the nature of their roles is being kept under wraps. The film - which is currently being shot in New York - chronicles the story of a Middle Eastern despot who is removed from his position and flees to the US after he is replaced by a lookalike former goat herder, with both roles being played by Sacha. Sir Ben Kingsley, Jason Mantzoukas and Anna Faris are already signed up to appear in the film, which is being directed by Larry Charles. 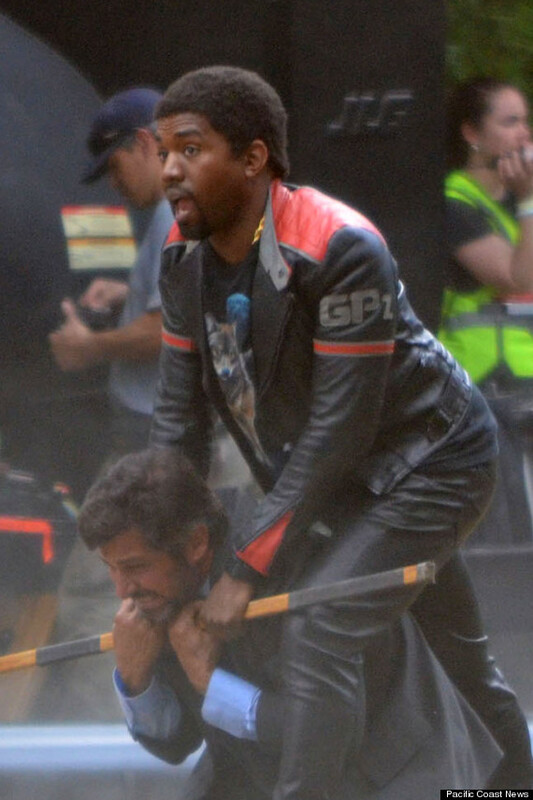 Last week, footage emerged of Sacha - in character for the movie - being apprehended by a waiter as he stole food from a diner at New York restaurant Orsay. 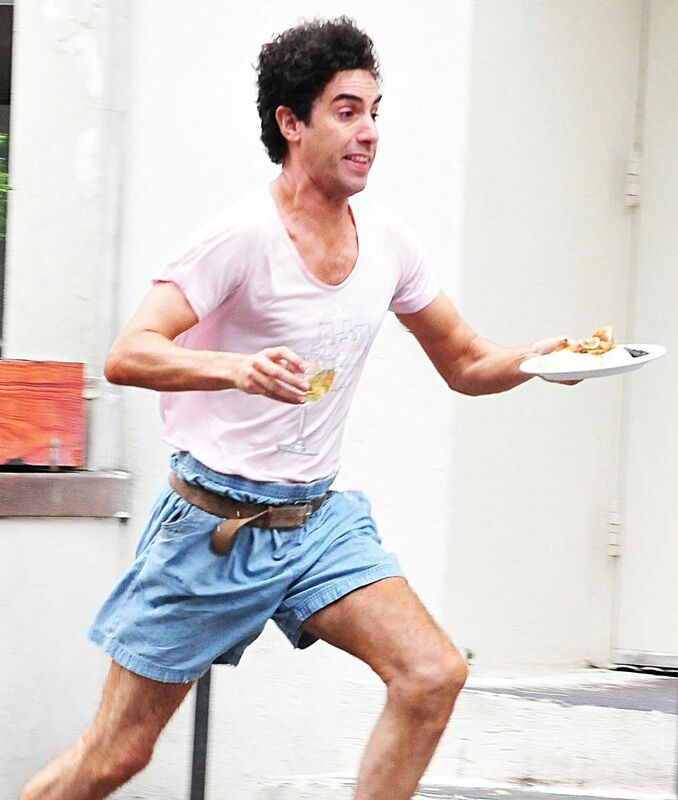 The comic, wearing a pink t-shirt and denim shorts, fled with a plate of food and a glass of wine, but was chased by the server and tackled to the ground. Later in the evening, he was seen in the same outfit outside a restaurant which doubles as the one his character owns in the film. And I thought Sacha Baron Cohen playing Freddie Mercury was interesting. 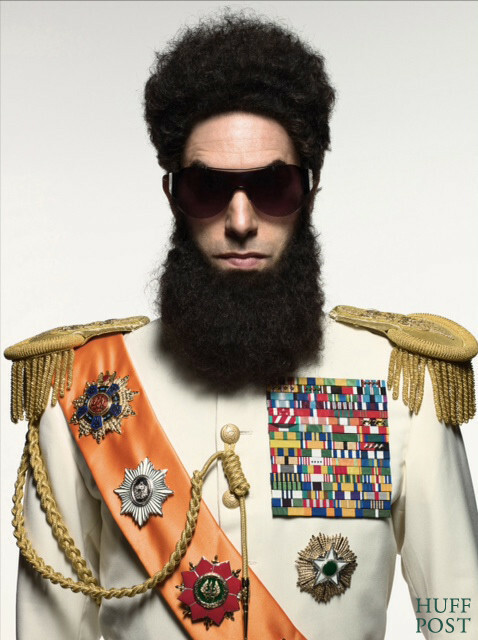 It’s been announced that Cohen will also star in The Dictator, an adaptation of Zabibah and The King. 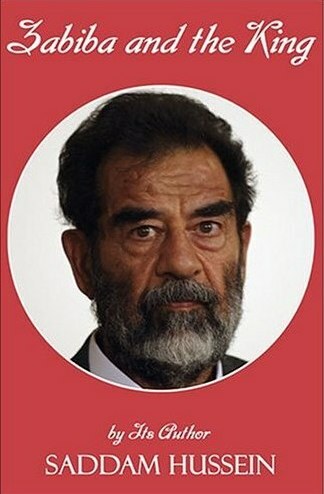 That’s a novel penned by Saddam Hussein (and/or his ghost writers) in 2000. The story about a woman who is raped by her cruel husband is believed to be an allegory about the United States’ invasion of Iraq. That “heroic” dictator, named Hussein, is the role Cohen will play. 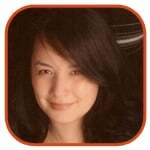 The movie, also being written by Cohen, will debut on May 11, 2012. Larry Charles (Borat, Bruno) will direct Cohen in this feature. Sacha Baron Cohen will be sporting a mustache once again for his next movie. The actor, best known as his alternate personality Borat, has been tapped to play late singer Freddie Mercury in a film about rock band Queen. The movie will focus on the band’s early years up to their performance at Live Aid in 1985. (You can see clips from that event above and after the jump.) Oscar nominee Peter Morgan (Frost/Nixon, The Queen) will pen the script. Daniel Craig has been voted Hollywood’s Hottest Torso. The 41-year-old actor topped a Lovefilm.com poll for the scene in Casino Royale where James Bond emerges from the ocean wearing a pair of tiny blue swimming shorts. He won 34% of the vote, while Gerard Butler came second with 21% for his shirtless scenes as Spartan king Leonidas in 300. Brad Pitt’s sculpted chest and abdomen in Troy secured third place with 13% of the vote. Sacha Baron Cohen came an unlikely fourth for his “mankini” scene in Borat, followed by Sean Connery in 1965 Bond adventure Thunderball and Leonardo DiCaprio in The Beach. Let’s face it: Daniel Radcliffe may be cute, but guinea pigs are cuter. Despite earning $78 million last weekend, Harry Potter and the Half-Blood Prince could not keep up the magic. The sequel fell to second place after earning a still impressive $29.5 million take over the past three days. Overall, the film has raked in $220 million to date and a delayed opening in IMAX theaters this Wednesday - Transformers 2 had been taking up room - should give the film another boost. So what could possibly scoot the wizards out of first place? Rodents. Disney, which has already seen The Proposal and Up premiere on top this summer, earned another victory with the debut of G-Force. The comedy about a bunch of whiskered CIA operatives roped in $31.6 million over the weekend, just enough for a close win. After putting up with a frustrating delay, eager Muggles rushed to the theaters this weekend in droves. Harry Potter and the Half-Blood Prince kicked off its extended debut with a record-breaking premiere ($22.2 million) at midnight Tuesday. The series’ sixth installment went on to earn $158 million over five days and officially became the biggest international opener of all time ($237 million). Despite the numbers, there was one film Half-Blood could not beat: The Dark Knight. At this same time last year, the Batman sequel had also racked up $158 million in sales. But that film did it in only three days.